This guide is intended to highlight some of the features available at the Ford Center for guests with disabilities. If you need assistance during an event, you may visit guest services in the main concourse at section 101. The Ford Center will attempt to reasonably accommodate any concern with regards to our guests with disabilities. Assistive listening devices are available at the guest services location on the concourse level free of charge. A major credit card or valid driver’s license is required for check out. You may retrieve identification when the unit is returned. The concession stands and restaurants in the building have been designed with all guests in mind. Accessible countertops and bar counters are at a height that is comfortable for everyone. Drinking fountains throughout Ford Center are accessible to those with disabilities. Most drinking fountains are located near restrooms or exit stairwells. Four public elevators make all levels of the Ford Center accessible. Two are located in the main entry plaza. One is near section 109 and the fourth is by section 120. Escalators for general public are located at each end of the main entry plaza. Crowd management personnel at the Ford Center have been trained in emergency procedures and will assist guests with disabilities in the event of an evacuation. Areas of rescue assistance are available and visual and audible alarms are located throughout the building for use in the event of an emergency. An emergency evacuation chair is also strategically located on the upper balcony level to help assist patrons if needed. The primary ADA accessible entrance is the main entry plaza and located off Main Street. Parking for disabled guests is available on a first come, first serve basis in the surrounding parking garages. Additional spaces can be found at the Civic Center and Old National Events Plaza. The vehicle must display a disabled parking placard or license plate. All public restrooms are accessible for our guests with disabilities. There are also ten family restrooms spread across three levels of the arena. 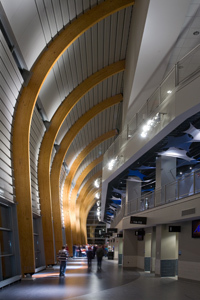 The Ford Center offers accessible seating in an integrated setting on all levels of the building. Accessible seating on the floor is subject to change depending on seating configurations for various events. Seats are sold with one companion seat. Exceptions may be granted through the Ford Center ticket office, space permitting. This seating allows the disabled guests an enhanced view, even when others are standing. In addition to wheelchair locations, modified aisle seats are also available. For more information please contact a Ford Center box office representative with any concerns or questions.